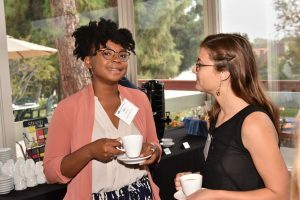 UCLA Luskin hosted an opening breakfast to kick off the 22nd year of the Senior Fellows Leadership Program, a mentoring program that matches UCLA Luskin graduate students with distinguished leaders from the public, private and nonprofit sectors. 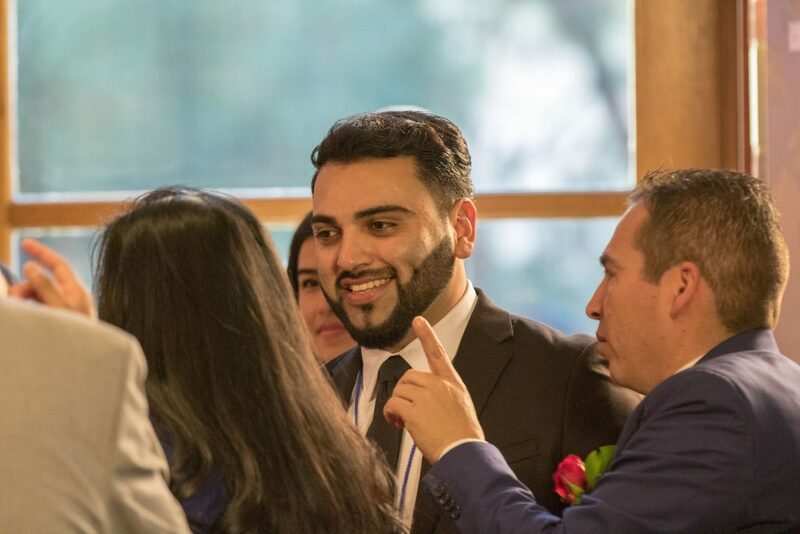 This program gives students an opportunity to enhance their academic experience by connecting and establishing networks with leaders in their areas of interest. 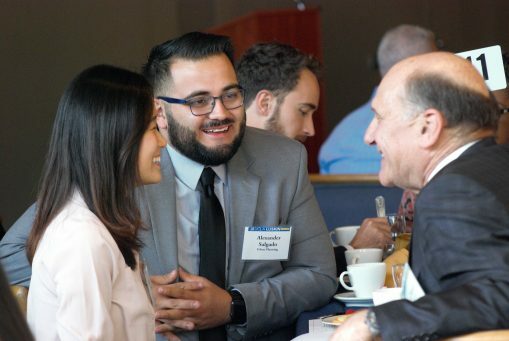 This year, Dean Gary Segura welcomed 12 new Senior Fellows, including several UCLA alumni, in addition to the 36 returning Senior Fellows, making up the largest group of Senior Fellow mentors in the program’s history. 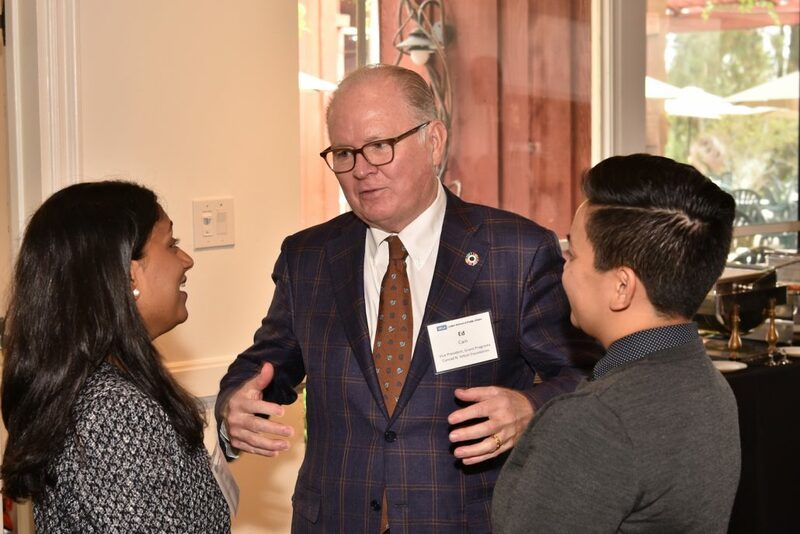 Edmund Cain, vice president of grant programming at the Conrad N. Hilton Foundation and returning Senior Fellow, was the keynote speaker for the Oct. 25, 2018, breakfast, which was organized by UCLA Luskin External Programs and Career Services. The event served as an icebreaker for students and their new Senior Fellow mentors, who will serve as role models for the next generation of leaders in public policy, social welfare and urban planning. 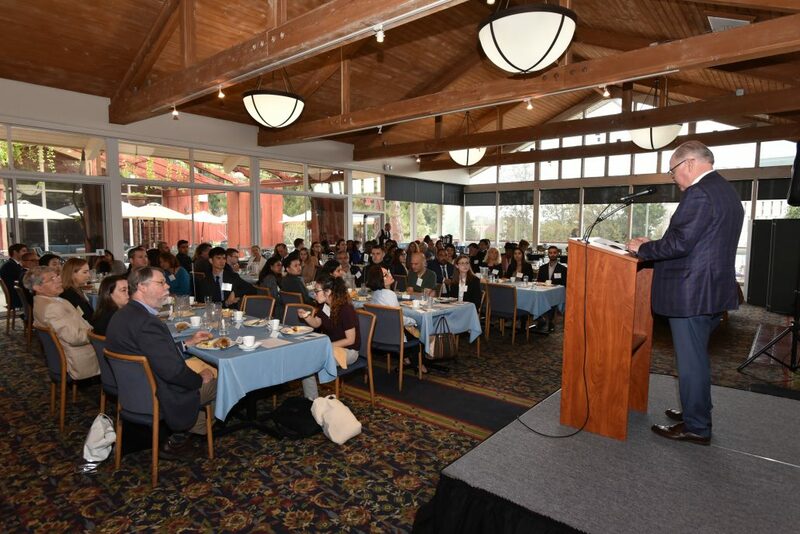 For more information about the Senior Fellows Leadership Program or to access a list of all past and returning Senior Fellows, click here. View more images from the 2018-2019 Senior Fellows Breakfast. 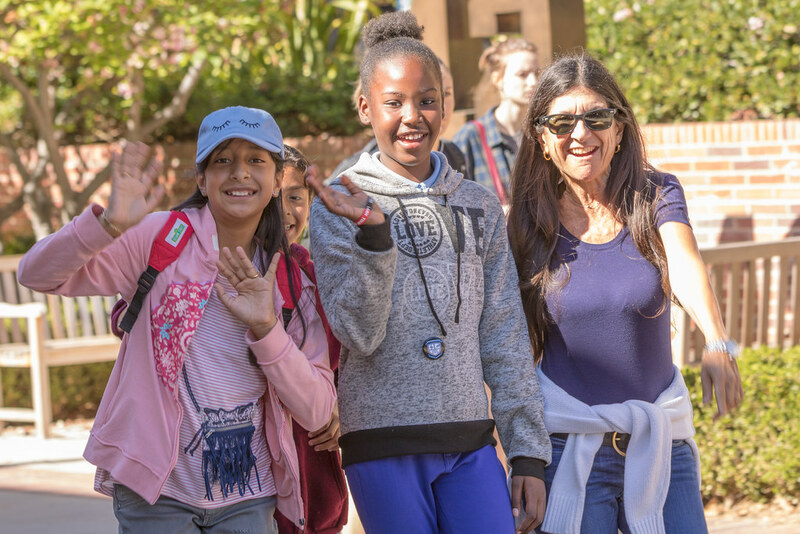 More than 45 students from Florence Griffith Joyner Elementary School in Watts spent the afternoon of Feb. 7, 2018, touring the UCLA campus thanks to the efforts of the UCLA Luskin-based Watts Leadership Institute (WLI) and GRoW@Annenberg. 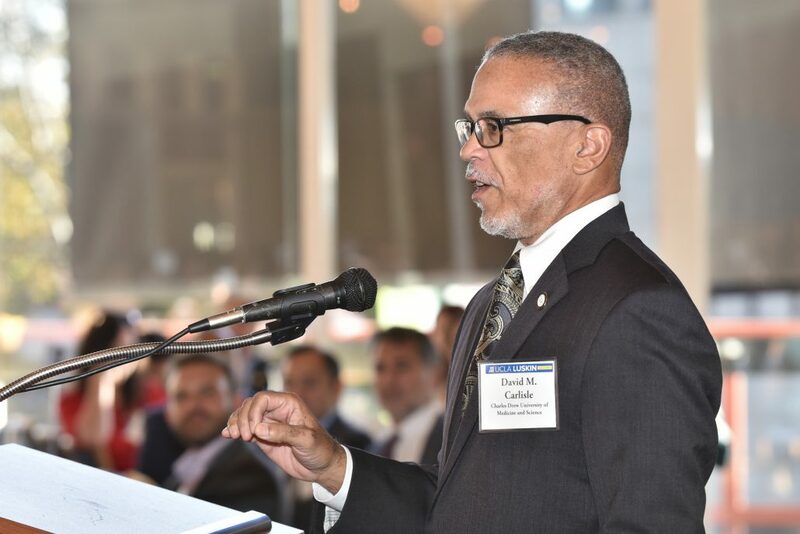 The daylong adventure for the students — known as “Keepers of the Dream” — was organized by Mike Cummings, also known as “Big Mike” or “Pastor Mike,” who is the executive director of We Care Outreach Ministries and a member of the first leadership cohort for WLI. The students started the day by visiting the middle school and high school they will attend, then traveled to UCLA, where they had lunch in the Covel Commons. 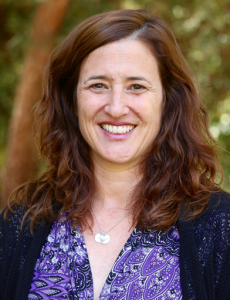 The UCLA “Cub” tour, which began at the Bruin statue in the heart of the campus, was coordinated Melanie Edmond, principal of Joyner Elementary School. The group also met with Jorja Leap ’78 MSW ’80 PhD ‘88, adjunct professor of social welfare and co-founder of WLI, a 10-year initiative to build a legacy of indigenous leaders and community empowerment in Watts. 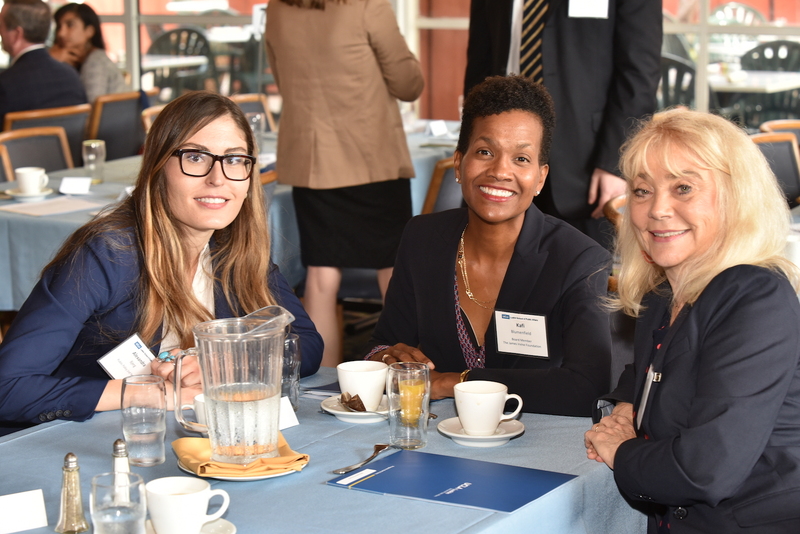 Karrah Lompa MSW ’13, co-founder of the Watts Leadership Institute, also participated. She said the inspiration and sponsorship of the program by GRoW@Annenberg, a philanthropic initiative led by Gregory Annenberg Weingarten, vice president and director of the Annenberg Foundation, has been instrumental to their efforts. UCLA Luskin was an active participant in the 2018 California Gubernatorial Forum held Jan. 25, 2018, at UCLA during which six candidates debated issues such as immigration policy, health care, education and ethics. Dean Gary Segura spoke at a VIP reception that preceded the debate and later welcomed attendees inside Royce Hall to the forum, which was sponsored by the Latino Community Foundation, a San Francisco-based group that invests in Latino-led organizations, and moderated by anchors Jorge Ramos and Ilia Calderón of Univision, a television and media company. 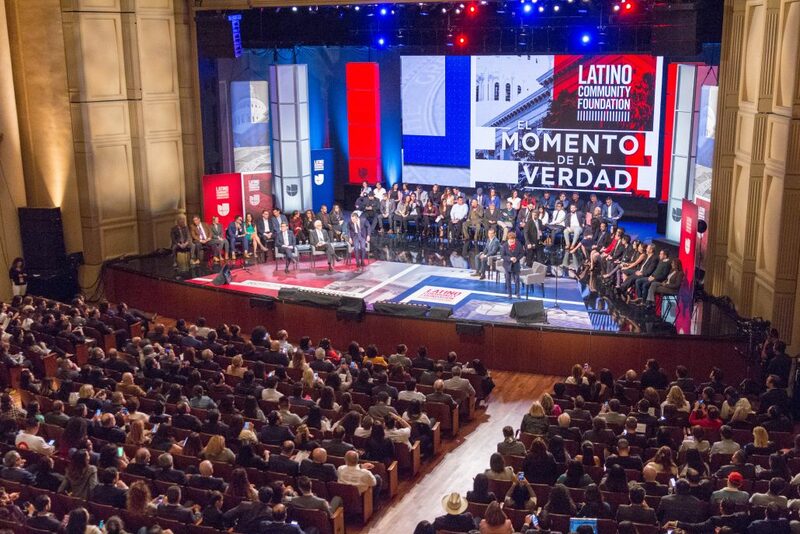 The Latino Community Foundation and Univision News hosted the 2018 California Gubernatorial Forum on Jan. 25, 2018, in Royce Hall at UCLA. 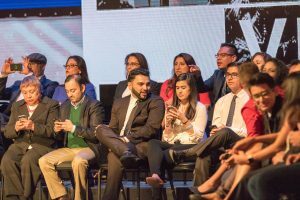 The Latino electorate, whose political clout continues to grow in California, could decide the governor’s race, and a focus on issues of importance to minorities was evident throughout the forum. 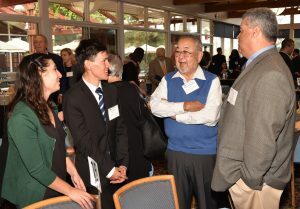 In addition to Segura, many other staff and faculty members affiliated with the new Latino Policy and Politics Initiative at UCLA were on hand. Several students, including representatives from all three departments at the UCLA Luskin School of Public Affairs, were seated on stage behind the candidates. 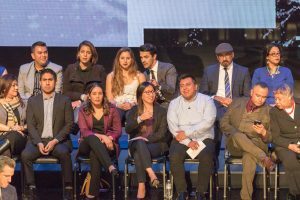 The night’s first question was about deportation policy, and it was posed by UCLA medical student Marcela Zhou and recent UCLA graduate Erick Leyva, whose educations have been directly impacted by the federal Deferred Action for Childhood Arrival (DACA) program that the Trump administration rescinded late last year. 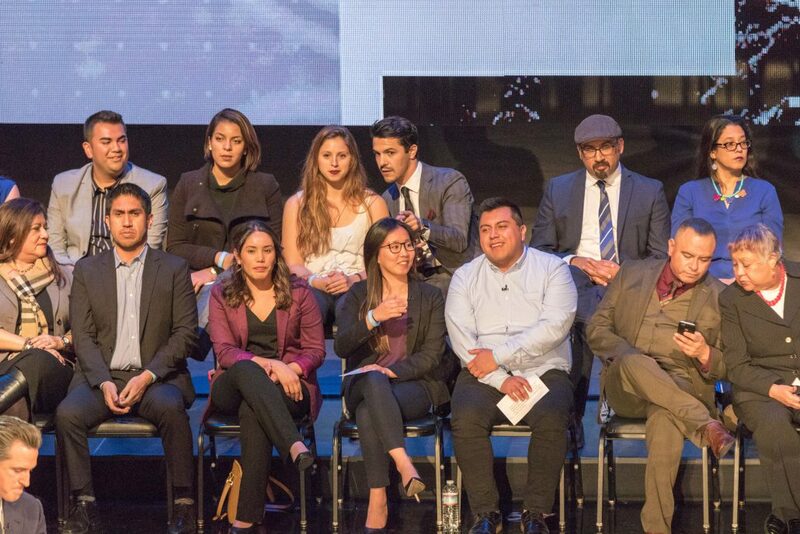 Gubernatorial front-runners Gavin Newsom and Antonio Villaraigosa both took advantage of the opportunity to publicly voice their support of DACA recipients and to stress agreement with California’s pro-immigrant stance in general, including its sanctuary state status. Under California’s new law, state and local law enforcement officials are prohibited from sharing undocumented individuals’ information with federal immigration authorities. The policy directly contradicts the Trump administration’s frequent portrayal of ethnic, cultural and racial differences in a negative light. 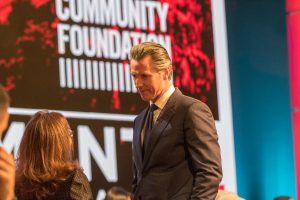 “We don’t tolerate that diversity, we celebrate that diversity,” said Newsom, California’s lieutenant governor. 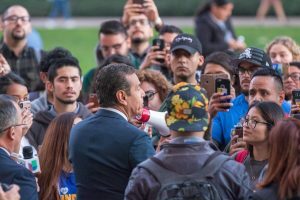 Former L.A. mayor Antonio Villaraigosa speaks with UCLA students protesting in support of the DACA program prior to the debate. Forum guests were greeted at the forum’s entrance by about 50 UCLA students demonstrating outside Royce Hall, calling on the gubernatorial candidates to support protections for all undocumented individuals — not just DACA participants. 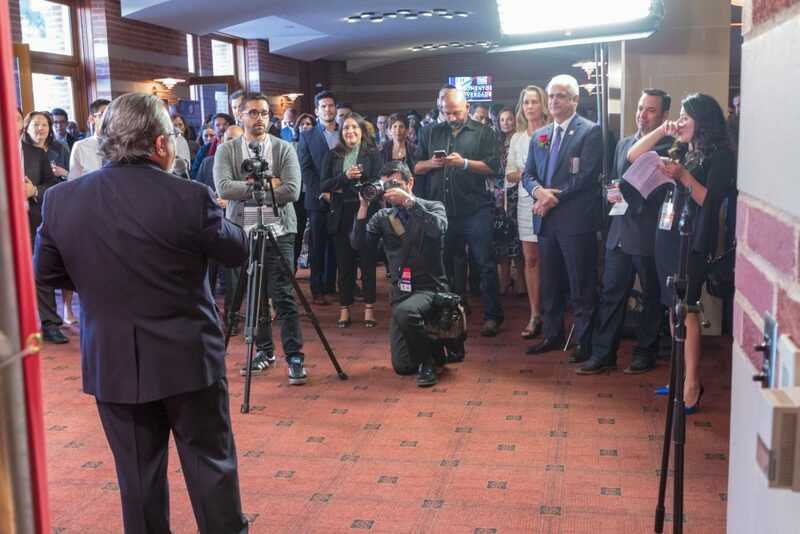 At one point, Villaraigosa waded into the crowd and declared his support for their viewpoint. 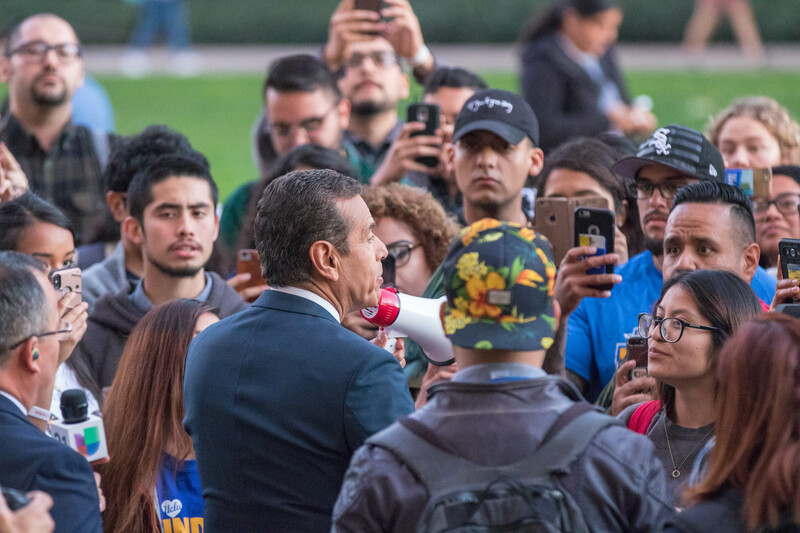 As the former Los Angeles mayor walked up the steps to enter the building, the students chanted, “Say It Inside!” — an effort to prod Villaraigosa to go on the record in support of undocumented immigrants. The two Republican candidates at the forum, businessman John Cox and Assemblyman Travis Allen (R-Huntington Beach), both oppose California’s sanctuary status and said the state’s support of undocumented workers undermines the needs of U.S. citizens. 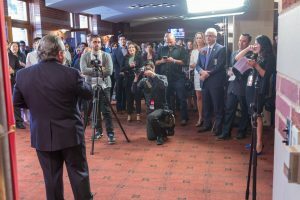 Their statements often led to boos from the crowd, and Allen, in particular, generated loud objections from the audience when he expressed full support for the policies of President Donald Trump. In strong contrast, the four Democrats often drew cheers with rebukes of Trump and his administration’s policies. To boost the numbers of Latinos pursuing higher education, Eastin suggested expansion of childcare and child development programs. 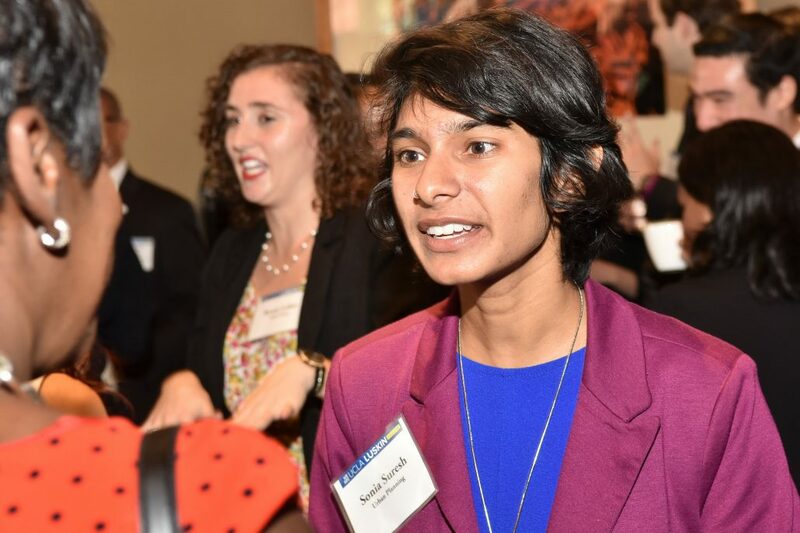 She and other Democratic candidates also advocated for free college tuition. “The best crime prevention program is education,” Eastin said. 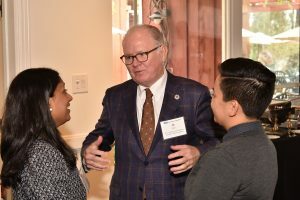 Responding to a question about California farmers, Eastin called for a long-range water plan and better treatment of agricultural workers. 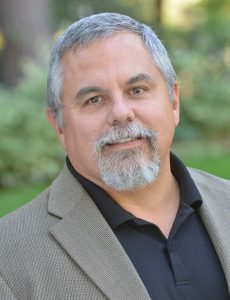 Cox said he sympathized with Central Valley farmers and supports a seasonal worker program “to have people come in and get the work done.” Once crops are picked, however, he said the workers should go back to their countries. The issue of single-payer healthcare prompted a testy exchange between Villaraigosa and Newsom, who favors improvements to the state’s proposed single-payer health-care legislation. 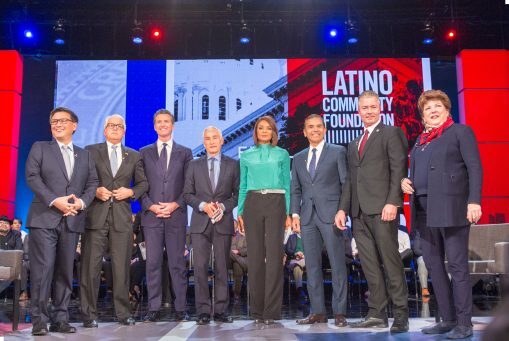 Villaraigosa disagreed, saying he is concerned the idea lacks concrete funding. “That’s defeatism,” Newsom shot back. 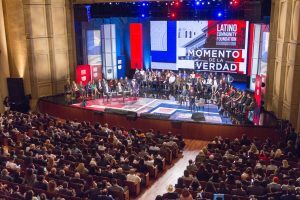 Near the end of the forum, one of the most dramatic moments took place when moderator Ramos returned to the question of undocumented immigrants. He reminded the crowd of the two DACA recipients who had opened the night’s questioning. “Would you deport them?” Ramos pointedly asked the candidates. In response, Chiang, Newsom, Villaraigosa and Eastin all said no, and that they would work to protect them. Even Cox said no, though he qualified his response by calling for stronger border security. Ramos gestured to Zhou and Leyva seated behind him, and they moved to center stage. 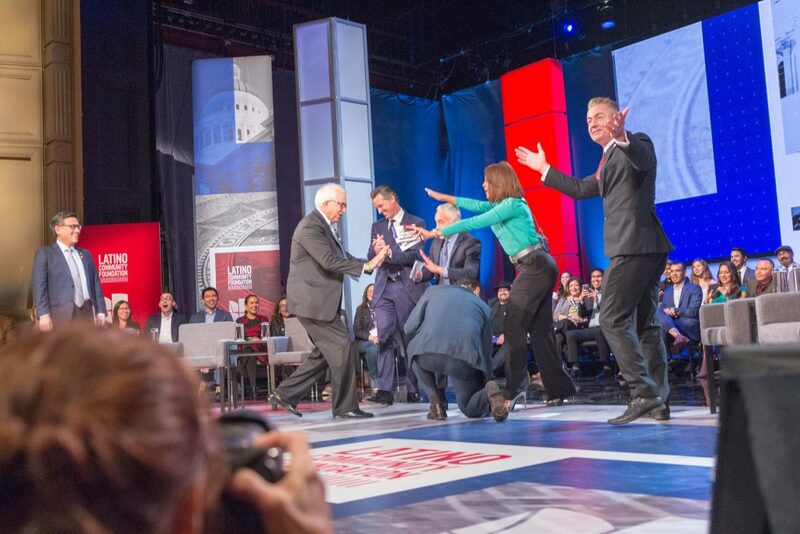 As Allen walked over and shook their hands, audience objections grew louder. “Yes or no? 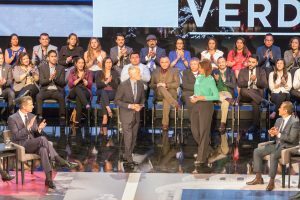 Yes or no?” the crowd chanted after Allen dodged a direct answer by saying Republicans plan to include DACA protection as part of immigration reform. The crowd grew even louder, drowning out Allen. “Make him leave! Make him leave!” some shouted. View a Flickr album with additional photos. New Dean of the UCLA Luskin School of Public Affairs talks about his vision for the school and its three departments on Oct. 19, 2016. 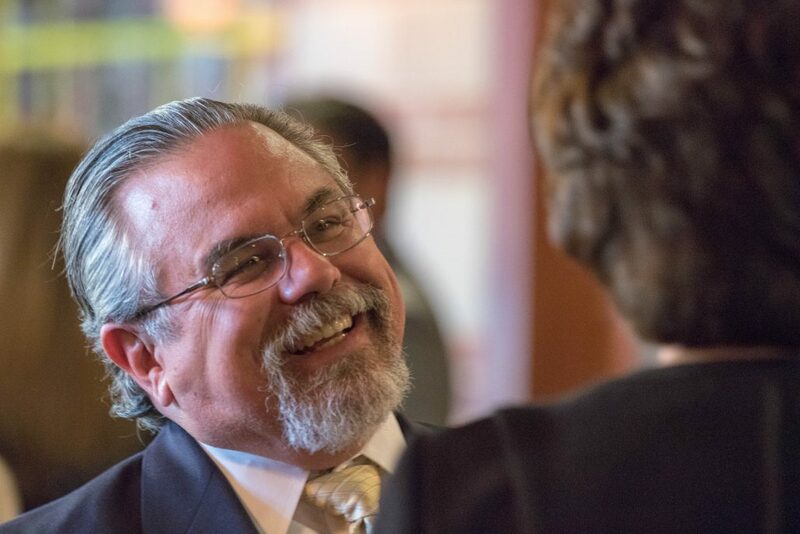 On Jan. 1, Gary M. Segura began his tenure as Dean of the UCLA Luskin School of Public Affairs. In a Q&A conducted soon after his appointment in October, Segura, professor of public policy and Chicano studies at UCLA and the former Morris M. Doyle Centennial Professor of Public Policy and professor of political science at Stanford University, discussed his new role and how excited he is to lead the UCLA Luskin School of Public Affairs. First of all, congratulations on being named the new Dean of the UCLA Luskin School of Public Affairs. Can you tell us your initial reaction when you got the news? Segura: I was stunned, in fact, and really quite surprised to hear the news. I was in Europe at the time and I’m a little embarrassed to say that I was on a beach when Provost and Executive Vice Chancellor Scott Waugh called me. But he was in Europe too, so we were in the same time zone, and it worked out OK. But I was really quite surprised and very, very pleased. 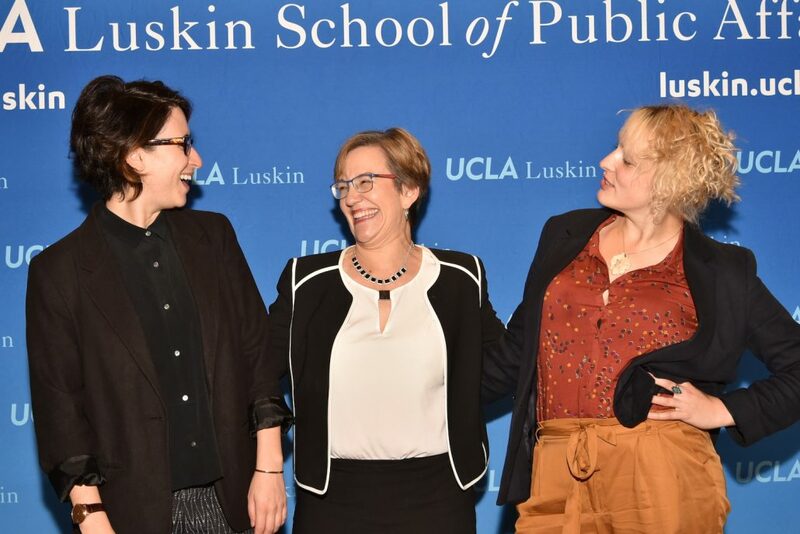 Can you share with us your initial thoughts on what you hope to accomplish when you get started, maybe in your first 100 days at the Luskin School? Segura: I’m not a physician — I’m not that kind of doctor — but my first rule is to do no harm. There are a lot of very good, wonderful and exciting things going on here. And my first step would be to find out what I need to do and where I can be helpful to enhance, enlarge and grow the existing areas of strength in the school. My second step will be a pure information-gathering one. I need to know the faculty. I want to know what their interests are, what they think we can do better, what they think is working well. And, also, test out a few ideas in terms of how we might broaden the footprint. 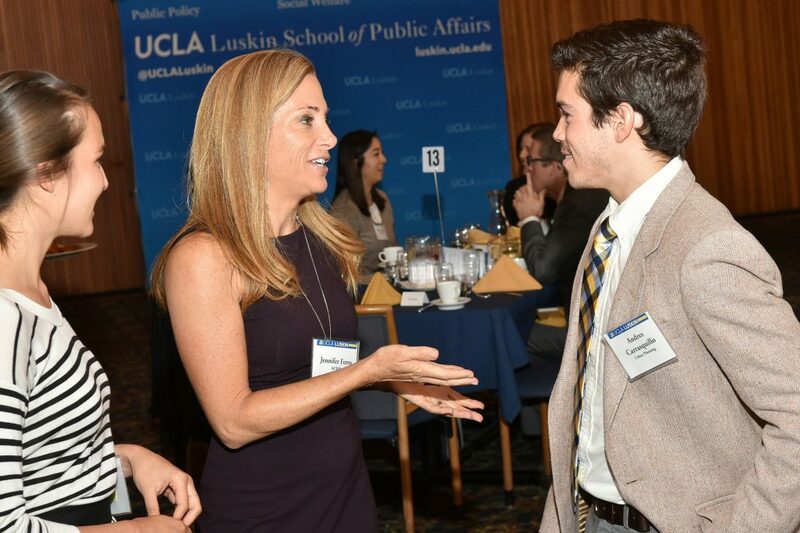 In the coming years, we will see any number of important opportunities and changes come to the Luskin School. I want to be certain to figure out how to make opportunity for growth or renewal a win-win for everyone. I think the first 100 days will be a lot of information gathering and a few trial balloons floated, and we’ll see if they get shot down or if they actually make it to the ceiling. 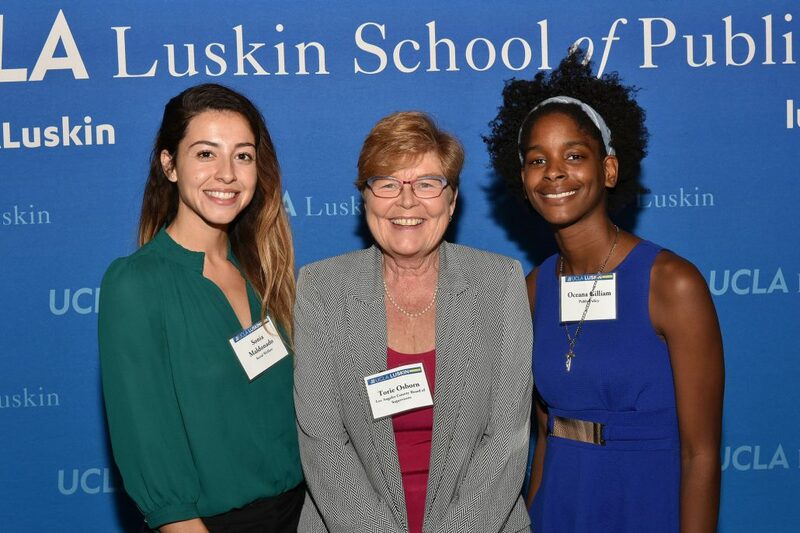 The Luskin School’s previous full-time dean, Franklin D. Gilliam, Jr., believed that Luskin prepared students for the future by providing them with a “change-agent toolkit.” Do you see Luskin continuing that role of helping our students become change agents? 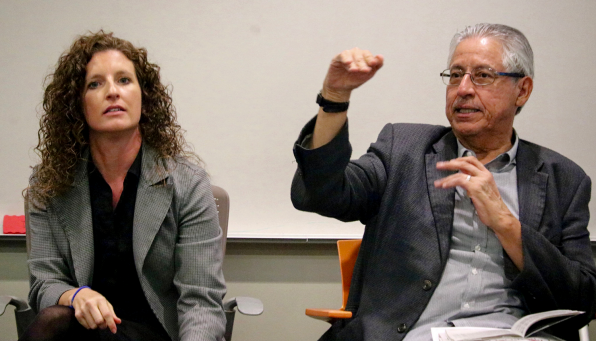 Segura: I would say I see Luskin continuing and extending that role, with the possibility of some additional programs at Luskin. I want to create an environment where we have a huge cadre of students who are going to engage the community as it exists. This is purposeful social science. This is the idea that understanding what’s happening in the world is only useful to the extent that we can then take it and make the world — at the individual level, at the family level, at the community level, at the nation level and maybe even globally — somewhat better than we found it before. 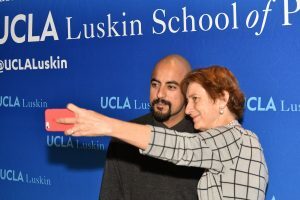 So I definitely believe in engaged learning, the idea that the tools they get at UCLA Luskin can be brought to bear on their life goals and their own communities and families. You are steeped in Latina/o, gender, political and all minority issues. 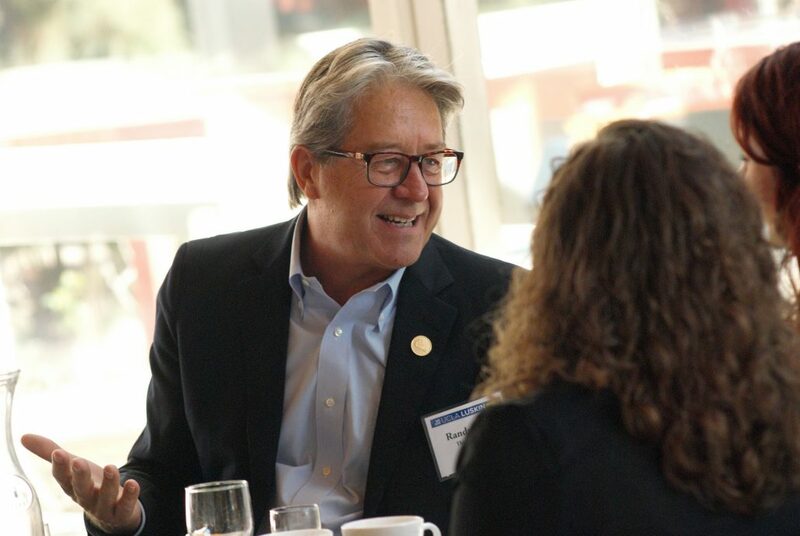 How has your academic background informed and prepared you for your new role as Dean here? Segura: This society is changing in ways that are unprecedented. In 1950, this society was 90 percent white. When Ronald Reagan was president of the United States in 1980, this society was 80 percent white. In the last national census, it was 63.7 percent white, non-Hispanic. And, in the next census, that number is likely to be around 60 percent. At the same time, we’ve had a revolution in gender relations in the United States over the last 50 or 60 years. So heterosexual white males, who have so dominated American society in all of its facets — whether it be governance, business, industry — those individuals comprise only about 30 percent of the national population. We have relatively little understanding of the other 70 percent. The traditional social sciences and even some of the public affairs and public policy folks in the world have devoted less attention because they were not the holders of power. What we’re seeing now is a gigantic change in the composition of the United States at every level. And I think preparing our students — many of whom come from that 70 percent — to engage in an America that fundamentally looks different than the one you and I grew up in is an important change. My particular research interests speak to that, but I’m certainly not alone in that interest and expertise. There are others in the school and others on campus and that’s a primary concern. Finally, any special message you’d like to share with our students, faculty, staff, alumni and donors? Segura: I’m very excited to be here. When you look for opportunities to take a leadership role, many of them look like just administrative roles, basically file cabinet management. I didn’t want that. 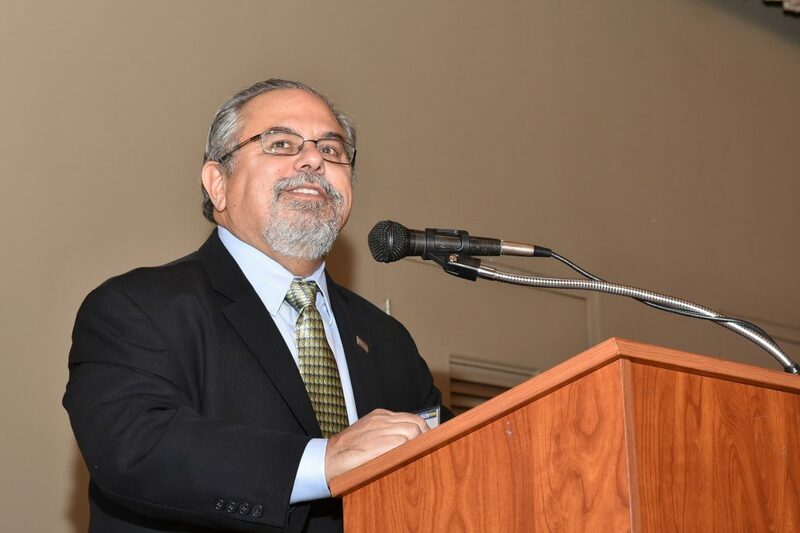 I wanted an administrative role where I believed in the mission of what I was doing. Here, we have three wonderful departments, an array of research institutes, all of which are dedicated to the improvement of the quality of life, of people living in the United States and beyond, especially in the Los Angeles basin. That’s a mission I can embrace and get behind and something I can actually bring something to personally. This was the right fit for me. I hope I can do my best to help everyone achieve the goals that they have for their time here at Luskin.